In healthy ecosystems, there are reserves of energy to be tapped. Now in our fourth decade, Thousand Currents created the same for ourselves. To date we have raised $1.7 million for our Baobab reserve fund to ensure the financial stability of the organization, funding continuity for our grassroots partners, and flexibility to fuel innovation and growth. In the life of any organization, there are bumps and bruises, prospects and opportunities. Over the last 30+ years of Thousand Currents’ history, we have experienced the same. 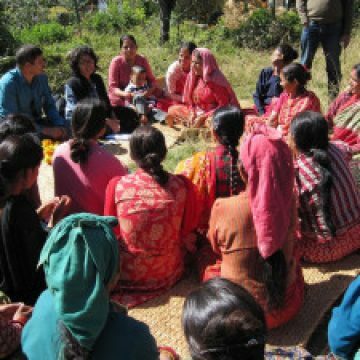 Thousand Currents (formerly IDEX) has invested in more than 500 community-led initiatives in the Global South. Today we are exchanging grassroots brilliance with powerful, proven agents for lasting and transformative change – over 2 million people annually. In the last few years, staff have worked hard to create a sound foundation for the future. And during this time, our partners have taught and encouraged us to build mechanisms for financial sustainability, as they have done the same with our long-term, flexible funding. In 2016, Thousand Currents decided it was time to the same for ourselves to strategize for resilience and sustainability, for partners and for itself. What does the Baobab Fund enable Thousand Currents to do? Maintain grant making to our partners, even in times of recession, honoring our long-term partnership model and buffering their important work from potential changes in the U.S. economy and foundations’ strategic interests. Create more space for originality, experimentation, and innovation, ensuring Thousand Currents’ continued leadership in the philanthropic sector. Respond to emergencies, disasters, and other unanticipated difficulties that our partners face, in advance of our own fundraising to support their efforts, which can take time that is critical in such situations. Make capital investments as opportunities arise. Ensure Thousand Currents is a strong and well-functioning organization with a long-term focus on supporting holistic, systematic, sustainable social change. The Baobab tree is a symbol of life and positivity, highly adapted to its environment. During the rainy season it efficiently absorbs and stores water in its trunk, enabling it to produce a nutrient-dense fruit even when the environment is dry and arid. Growing wild in 32 countries across the African continent, the Baobab is at the heart of many traditional remedies, tools, and folklore, and it can have a lifespan of more than 1,000 years.